The first possibility – one that many investors fear – is that we see a global downturn, a U.S. recession (the first in more than a decade), and a bear market in 2019. The second possibility is that markets already saw their worst in the fourth quarter of 2018. You could count it as one of the quickest bear markets ever, with signs of a recovery already in place. In this second scenario, bullish forces will send stocks to new all-time highs, resetting the clock on recession fears. What might surprise you is this: A big potential catalyst for either scenario is not the United States... but China. The recession of 1979-1982 took place when the U.S. Federal Reserve tried to "break the back of inflation" with sky-high interest rates. The next recession in 1991-1992 came in the aftermath of the savings and loan crisis. Then, the 2000-2002 recession came after the dot-com bubble burst. And the 2008 global financial crisis followed a subprime crisis and U.S. housing bubble. So, recessions don't just happen out of the blue. Here and now, Wall Street economists and investment bank research departments have made a wide range of estimates as to the likelihood of a 2019 recession. But rather than play an impossible guessing game... I suggest you watch what happens with China. One of the biggest questions facing the markets right now is this: Will the U.S. and China reach a trade deal? 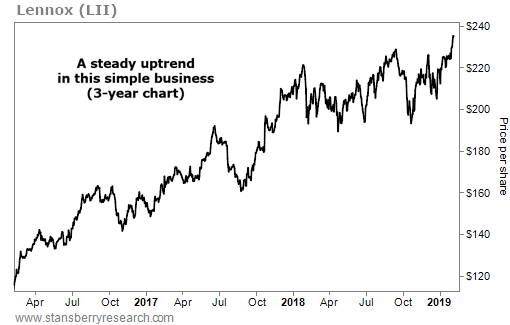 The quick recovery we've seen in the major U.S. indexes – and also in crude oil, which is up more than 25% since Christmas Eve – suggests that investors are getting more optimistic. But a China deal will have to go through for that optimism to stick. The resolution of U.S.-China trade tensions would be a bullish sign for the global economy, which could inspire a strong bull run in U.S. stocks. Failure to resolve trade tensions could lead China's economy to slow down too quickly, sending the global economy into recession (and possibly the U.S., too). The bullish outcome is the most likely... because both Washington, D.C. and Beijing have strong incentives to reach an agreement. In Washington, the Republican-led executive branch is starting to think about the 2020 elections. The Republican Party wants a happy, healthy stock market if at all possible – not a bear market on its watch right before an election year. And delivering a trade deal with China is crucial to keep investors happy. Meanwhile, the leadership in Beijing knows China's economy is in a tough position. An estimated one out of five apartments in China's cities (65 million in total) are unoccupied. The country's real estate bubble is deflating. And the Shanghai Composite Index was one of the worst-performing global indexes last year. President Xi Jinping, China's leader-for-life, cannot afford the economic pain of an ongoing trade war right now, and he knows it. Of course, the deeper issues causing tension between the U.S. and China are real, and hard to sweep under the rug. However, a deal would be a major win-win for Washington and Beijing. Last month, China made a stunning offer to buy an additional $1 trillion in U.S. imports over a period of six years. For now, President Donald Trump is still taking a tough stance. But if a new deal with a big, impressive headline number like this goes through, it could be a game changer for stocks. Investors could ramp up optimism again... leading the stock market to dramatic new highs. And it's one of the biggest factors that will decide the future of the markets in 2019. Editor's note: Next week, Richard will discuss all the major forces at work in the markets... along with some of the most recognized bulls and bears from Stansberry Research and the broader investing world. Together, they'll answer the BIG question: What should you do with your money in 2019? Tune in for the online event on Wednesday, February 13. It's completely free... All you need to do is RSVP right here. Regardless of how the markets move after a U.S.-China trade decision, it's more important than ever to have a plan in place to fortify your portfolio. Read more about Richard's system right here: Eight Simple Steps to 'Foolproof' Your Portfolio. "We have a simple recipe for making money in the markets," Brett Eversole says. "Find something that's dirt-cheap... that no one else is interested in owning... and buy it once prices reverse." Right now, he has his eye on one market that could be poised to soar in 2019... Learn more here. Lennox (LII) is a $9 billion company that makes heating, ventilation, and air conditioning (“HVAC”) and refrigeration equipment. That’s what it’s been doing for 124 years. Climate control might sound boring… But in each of the past five years, Lennox has delivered record-breaking revenue. Most recently, it brought in $3.88 billion in sales last year.